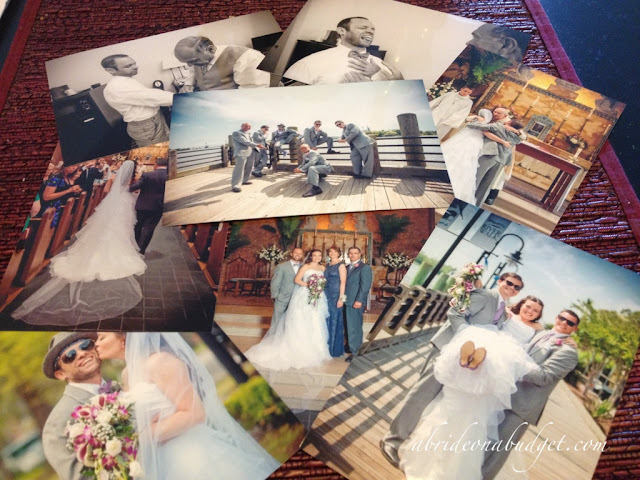 A Bride On A Budget received an identical code for photos and shipping to aid in this review. All thoughts and opinions belong to ABOAB. I love printing photos. I know I'm in the minority because most people just upload photos to Facebook or Instagram and they exist digitally only. But I love physical photos. I love to hold them and enjoy them tangibly. And I know photo books are all the rage, and they're cool and I really love them, but you can't put a photo book in your wallet. My dad always had a wedding photo, plus photos of us kids, in his wallet. I haven't seen his wallet in a long time, but I'm pretty sure they're still there. And that's amazing and sweet -- and something you can't have if all your photos exist on the Cloud. I recently printed 100 photos from MailPix. The process to order photos is simple. Upload your photos (from your computer, phone, or social media pages), choose the quality of the upload (express is for 4x6 prints, fast is for 8x12 quality, and large is for posters and gifts). The photos will then be available for you to choose to print. The default is one, but just click on the plus sign and you can increase the quantity. I didn't see a way to increase the number of prints without pushing the plus sign. That would be helpful if you were printing 100 of the same photo. I placed my order on a Wednesday and they were in my mailbox on Monday. That was standard shipping. You can choose two-day or overnight shipping if you want to pay more and need them quicker, but I was fine with five days (which included the weekend). The photos arrived in two envelopes inside an envelope. My photos arrived in really good shape too. Nothing bent, torn, or tattered. And the color on them! They're so bright and vibrant. The quality of our photos was really high (you definitely get what you pay for; that's one of the tips in my five tips to hiring a wedding photographer post) so it's great that the quality of printing parallels that. They're printed on Fujifilm, in case you're wondering, and they're glossy. To me, that means that when I'm flipping through the 100 photos I printed, they slide easily. I can just glide through them quickly. Although, if you know me, you know I'm the slowest person when it comes to looking at photos because I start in the background. I'm always looking to see what is happening behind the photo and where it's taken before looking at the photo itself. I started doing this way before the days of photobombs, so it's not that I'm looking for someone popping out where they shouldn't be. I just like to look to get a feel of the photo first. That's part of why I like looking at actual photos, not ones on someone's phone. You can't stare at someone's phone long enough to get the same feeling (if you do, you'll probably get interrupted by a text, have to hand the phone to its owner, and you may never get it back to finish looking at the pictures). Now, for those of you who were at #BridalBabble last Wednesday, you know I was late because I was trying to resize photos. I wanted 3x5 photos and MailPix's smallest print size is 4x6. I was trying to figure out how to add a one inch border around the photo without Photoshop. I got the suggestion of using Google's photo editing service to resize the photo to 3x5, then put it back on a 4x6 photo and the border would exist. It seemed like it worked online and I spent about three hours adjusting 50 photos this way. Thank goodness that they came out correctly. I just used a paper trimmer to cut the photos and they fit in our thank you cards. MailPix does more than just print photos. You can also make a ton of photo gifts, from blankets to calendars to mugs to growth charts. Sounds like another way to have tangible wedding photos. 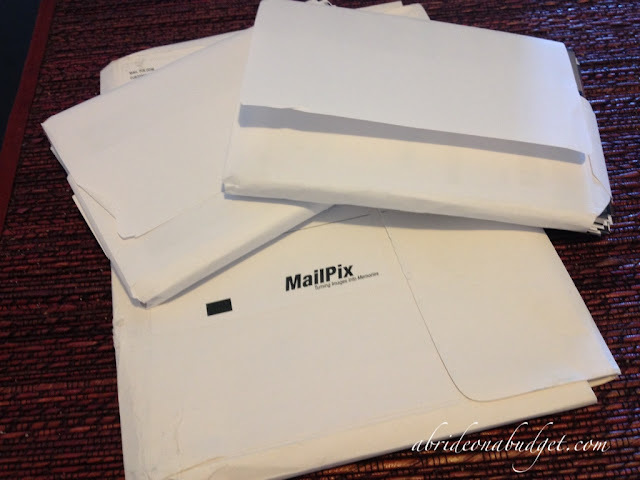 BRIDAL BABBLE: What other MailPix products do you like? I LOVE the prices on their photo prints!! I would love to have any of their products! I like their framed canvas prints! My favorite is the 8X10 Metallic Aluminum Panels! I love taking pictures but I'm Definitely one of those people who rarely print them out. I'd love to win and all their products are great! I love the mini photo book! I cannot believe what good quality photos they are (love that Fuji glossy!) and how fast they print. What a great way to share my wedding with my grandparents and family members who could not make it out to TX for our wedding! 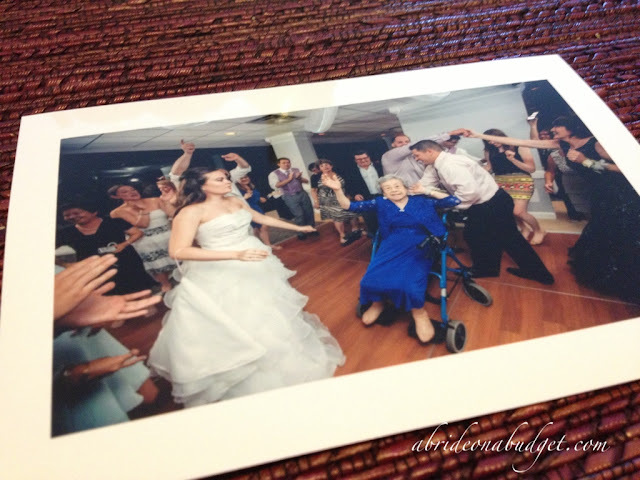 Your wedding photos are so beautiful and fun! I like the mixpix lay-flat photo book, and the mini photo book. I love the lay flat books! I love the miniature photo book, but all the ported products are fantastic! I like the heart and soul of photography. Shaleta G.
These would be perfect t print out photos for my upcoming October wedding! I like the miniature photo books! Printed pictures are like books. No electronic version can replace them. Free photo book Monday! How awesome is that?! They have great prices, but my favorite thing is that they have a free photo book every Monday! That means I don't have to freak out and organize my pics today - I can get them ready for next Monday! Woot! I'd love to have a Framed Canvas Photo Print. I love the photo cover books. My favorite product is the Panoramic Photo Canvas Prints! They have such a great selection! I like the mini photo books. I like the photo books and custom calendars. My favorite item is the Personalized Travel Coffee Mug. I like the Travel Mug. I rarely ever print pictures out because my printer photo quality is not great and I don't have time to go somewhere and print them out. Would love an opportunity to try this process out to print engagement pictures to give to family friends and to print out pictures of all the fun events leading up to my October 2015 wedding! Would love to get a canvas print of my family. I really love to win it and try it! I love the fleece blanket....a wonderful gift idea for special occasions and the holidays! Oh I really love their 12x18 Canvas (1.25" thick)! I have a favorite picture of Carter that I would love to have on canvas and hang it up in the entry way! I love the fleece blanket. So very cute. I love the wrapped canvas! I would love to get a few of those with vacation pictures to use as wall decor in our house! I love the Framed Canvas Photo Prints! The mini photo book is nice. My favorite is definitely the Framed Canvas Photo Prints. I love the iphone photo cases. I never saw those before. I really love the glass cutting boards! These would make a very special and unique gift! I love the ball ornament. What a great keepsake. They have great products. My favorite is the Gallery Wrapped Canvas Print. I love the Premium Fleece Blanket. I love the 8 X 10 canvas. Free prints are perfect to share with close family!!! I would love the canvas to put over our bed also! I really love the Customizable Children's Growth Chart! I like the sale on the 8x10 canvas. Do I have to print all wedding pics? I like the Premium Fleece Blankets. I really like their 4x6 mini photo books. The wire binding makes them less susceptible to bending the spine. And their price is great - I could order lots and often and then pop them in the mail to the kids' grandparents for little surprises. And keep one for myself and let the kids have another - they love looking at picture books of themselves!